It's fall and it's when I tend to use certain baking spices specifically this time of year. Those spices include cinnamon, cardamom, allspice, cloves and nutmeg. Together, they create a sense of warmth and comfort in baked goods. When I came across a recipe for spice cake from Cooks Illustrated, I thought about how a typical spice cake recipe can be used to highlight fall flavors. To this spice cake recipe, I added chopped apples and walnuts to ultimately create these Apple Walnut Cupcakes. After frosting with a simple Vanilla Bean Buttercream and garnishing with chopped walnuts, it was great treat to capture the flavors of fall and make use of apples in season! I really enjoyed these cupcakes because they filled up my kitchen with an amazing aroma. The brown butter really does something for this cake and once the spices are added, the aroma just intensifies and fills up your kitchen. The ingredient list may seem a bit much, but really it's worth it. It smelled awesome baking up and it was hard to resist trying a cupcake fresh out of the oven. The crumb is tender and with the apples and walnuts mixed in, the texture they add works nicely. This cake recipe is pretty versatile in that I ended up using the recipe to create 2 more cupcake flavors (pear & ginger cupcakes and pumpkin spice cupcakes, which will be featured on the site in the next day or two.) Feel free to adapt this recipe further... by perhaps incorporating caramel, pecans or a mix of other baking apples. For the frosting, I used a simple Vanilla Bean Buttercream out of convenience since I had 3 other cupcake flavors to frost using the same flavor as well. An idea is to reserve some of the spices used in the cake and stirring that into the buttercream to match with the cake. However for the frosting I made I decided against working with a vanilla bean as called for in the original recipe. Instead, I used one of my favorite vanilla bean shortcuts, which is to use vanilla paste. It's a vanilla product combining the seeds of the bean with a thick, intense vanilla extract. I like the convenience of this product and I get the same flavor with specks of vanilla too. You can find vanilla paste online and at other gourmet retail shops. My preferred brand is made by Neilsen Massey. Adjust oven rack to middle position and heat oven to 350 degrees. Preheat the oven to 350 degrees F. Line 2 (12-cup) muffin pans with cupcake papers. Combine spices in small bowl. Heat 4 tablespoons butter in 8-inch skillet over medium heat until melted, 1 to 2 minutes. Continue to cook, swirling pan constantly, until butter is light brown and has faint nutty aroma, 2 to 4 minutes. Add spices and continue to cook, stirring constantly, 15 seconds. Remove from heat and cool to room temperature, about 30 minutes. Whisk flour, baking powder, baking soda, and salt in medium bowl. In small bowl, gently whisk eggs, yolks, and vanilla to combine. In standing mixer fitted with paddle attachment, cream remaining 12 tablespoons butter with sugar and molasses at medium-high speed until pale and fluffy, about 3 minutes, scraping down sides and bottom of bowl twice with rubber spatula. Reduce to medium speed and add cooled butter and spice mixture, ginger, and half of egg mixture; mix until incorporated, about 15 seconds. Repeat with remaining egg mixture; scrape down bowl again. Reduce to low speed; add about one-third flour mixture, followed by half of buttermilk, mixing until just incorporated after each addition, about 5 seconds. Repeat using half of remaining flour mixture and all of remaining buttermilk. Scrape bowl and add remaining flour mixture; mix at medium speed until batter is thoroughly combined, about 15 seconds. Remove bowl from mixer and fold batter once or twice with rubber spatula to incorporate any remaining flour. Fold in chopped apples and walnuts until fully incorporated. 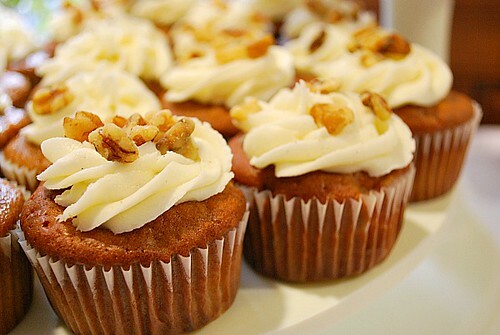 Using a star tip with a pastry bag, pipe the frosting onto the cupcake and garnish with chopped walnuts.